The Eastern Suburbs Railway Line is 7 km long line, serving 7 stations along its way. Opened in 1979 by Neville Wran, the then New South Wales premier, this commuter rail located in Sydney is owned and operated by infact two separate entities. Its ownership lies with RailCorp, while Sydney Trains is responsible for its operations. Most of the stations along the line are infact underground. At Erskineville, it meets the Illawarra line, forming the Eastern Subs & Illawarra line. Map of Eastern Suburbs Railway Line (in blue) showing its stations. Click on the map to enlarge it or download Eastern Suburbs Railway Line Map in PDF. The line begins operations at around 04:30 am in the morning and continues service till around 01:00 am, the next day. The frequency of the trains however, differ with the time of the day and the day as well. During peak-hours on weekdays, the trains arrive every 3-5 minutes. At other times and on weekends, the frequency is slightly lesser with a gap of around 8-10 minutes between every train. All stations along the route are located underground. This railway line has a connection with the Illawarra Line at the Erskineville Station, resulting in the formation of the Eastern Suburbs and Illawarra Line. Bondi Junction, Martin Place and Central stations have turnbacks for the services in operation along the route. A twin-track service, the Eastern Suburban Lines feature eight stations, each of them connected by means of tunnels and viaducts. The platforms feature colourful tiles and terrazzo finishing on the surface. 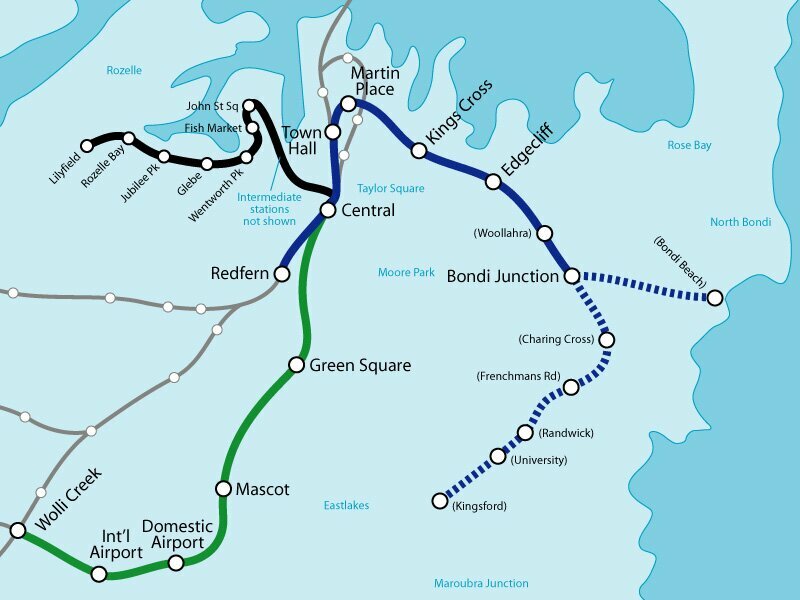 The Bondi Junction was initially an intermediate terminus having a terminal capacity that was far lower than the capacity of the running line. As a result, significant replanning was carried out at the turn of the century to increase its efficiency and bring it up to the level of other terminus stations in the country.